After recently being exposed for leaking explicit photographs of female arrestees, California Highway Patrolman Sam Harrington has resigned from the agency and charged Friday with two felonies for allegedly sharing these pictures with fellow officers. What this exposes is who law enforcement hires, the lack of annual polygraph testing of all officers from the chief down to ensure the public of their safety. The fact is some of the worst criminals, bullies, thugs and con-artist get hired and are given guns and authority over our loved ones. The fact that most victims who come forward exposing these monsters are then victimized themselves is another major problem. Racist, immoral and unethical officers exist in almost every Police Department in America today. Protected, immune from most prosecution, most are rewarded for doing the wrong thing. Paid leave, huge benefits and pay raises to some officers who even committed murder. What people need to understand is the unfair and biased relationship between our courts and law enforcement. They rely on each other therefore can’t be counted on to prosecute, investigate or punish each other. Bad judges are not investigated or jailed by police as are Bad Police who go before biased courts and judges. There are more of these criminals involved but California Highway Patrol does not care about Public safety, they care about hiding the problems. demand all of them are given annual polygraph tests no one is safe. 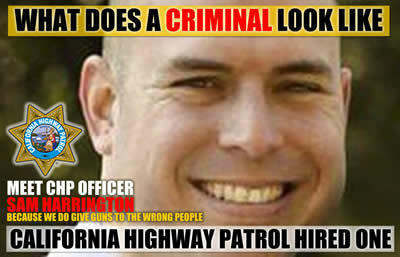 Sam Harrington is just one example of many California Highway Patrol employees who have no business having a gun or badge.